Phosphorus is the second-most-widely used fertilizer nutrient, after nitrogen and before potassium, with phosphate rock being the most important source of phosphorus. Global production/consumption of phosphate rock is concentrated in China, Africa, the United States, Eastern Europe, and the Middle East. Driven by downstream fertilizer production and consumption, especially in Africa, Eastern Europe, and the Middle East, global phosphate rock production/consumption during 2018–23 is forecast to grow at an average annual rate of about 3%. China is the largest phosphate rock producer, accounting for almost 50% of world production in 2018. In October 2008, the Chinese government enacted stricter controls for exports of phosphate rock, based on the need for self-sufficiency with respect to domestic consumption for fertilizer production to be used in food cultivation. Africa, the United States, Eastern Europe, and the Middle East are also large producers. 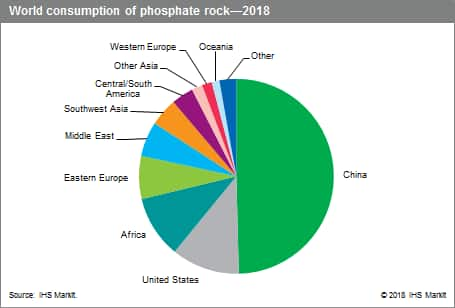 World phosphate rock production increased significantly between 2000 and 2018. The largest increases occurred in China, Africa, and the Middle East, while large declines occurred in the United States. Production from countries like Morocco, Tunisia, Jordan, Saudi Arabia, Russia, and Peru has increased. Relatively high growth is projected during the forecast period to 2023, with the largest increases expected in Africa, the Middle East, and Eastern Europe. The primary market for phosphate rock is the production of phosphate fertilizer products such as ammonium phosphates and superphosphates. Phosphorus is essential for the development of roots in plants and also assists in producing higher yields. Fertilizer production accounts for an estimated 78% of the global market for phosphate rock, with animal feed accounting for about 6%. The remainder is consumed in a variety of industrial applications, such as organophosphate pesticides, water treatment, food additives, dentifrices, fire control chemicals, and metal finishing. Most companies are vertically integrated and mine their own deposits to concentrate and manufacture downstream fertilizer products. The United States had been the largest phosphate rock–consuming region; however, China surpassed the United States in 2006, and, based on P2O5 content, accounted for almost 50% of apparent world consumption in 2018. The United States is now second, accounting for about 11% of apparent world consumption in 2018. Africa is third with about 10% in 2018, while Eastern Europe (the former USSR) remains a large consumer. The largest increases since 2000 occurred in China and Africa, while significant declines occurred in Western Europe and Japan. World apparent consumption has increased at an average rate of about 3.5% per year since 2000 and is projected to increase at a slightly lower rate during the forecast period, led by large increases in Africa, China, Eastern Europe, and the Middle East. Declines of major significance are not expected in any region. The industry has made major improvements in environmental controls to reduce the release of atmospheric emissions and liquid effluents from production sites. Direct application of phosphate rock as a fertilizer can obviate the need for processing, resulting in reduced production of phosphogypsum and greenhouse gases. Even then, there are fears that as more phosphorus is introduced into the environment, runoff containing phosphorus could affect the ecosystem by increasing the growth of algae and causing eutrophication and dead zones caused by a lack of oxygen. The five largest corporate producers worldwide are OCP, S.A. (Morocco), Apatit OAO (Russia), Mosaic Company (United States), and Yunnan Yuntianhua Co., Ltd. (China). Africa, the Middle East, and Eastern Europe have dominated world phosphate rock exports. World trade is expected to remain stable during the forecast period as global demand increases.